Painted and printed in honor of the crew of twenty-four that died in the crash of an E-3 AWACS aircraft at Elmendorf AFB, Alaska on 1995. 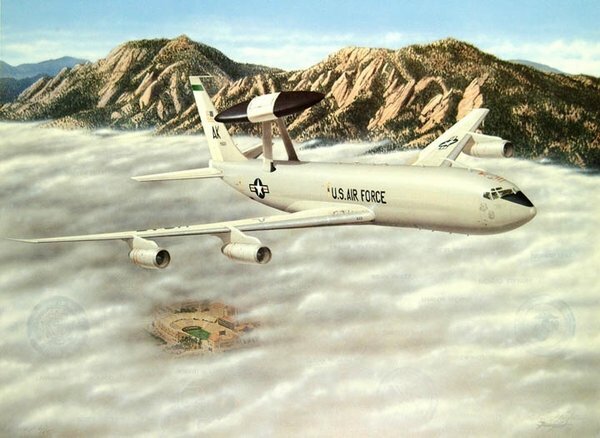 "YUKLA27" depicts an E-3 AWACS flying north past the Flatiron Mountains near the University of Colorado in Boulder, Colorado. Seals of four military branches and the names of the twenty-four crew are painted into the clouds below the aircraft. Only 85 artist's proofs available printed on 100% acid-free cover stock.